Ua Deungseon was the convincing winner of the Donga Ilbo Cup at Seoul this past Saturday, outpacing long-shot Ruby Canter and Horse Racing Ireland Trophy winner Pinot Noir by two lengths. In a race designed for fillies who came close in the Oaks, couldn’t quite get it done, but still harbour hopes of competing in the big Stakes races later in the autumn, Ua Deungseon, 7th in the Classic at Busan last month, was sent off as a 5/1 shot. Tracking the longshot, Ruby Canter, who stayed on for a very impressive 2nd place, Ua Deungseon hit the front in the home straight and took a comfortable win. She moves on to 5 wins from 8 starts and there looks to be plenty to come. 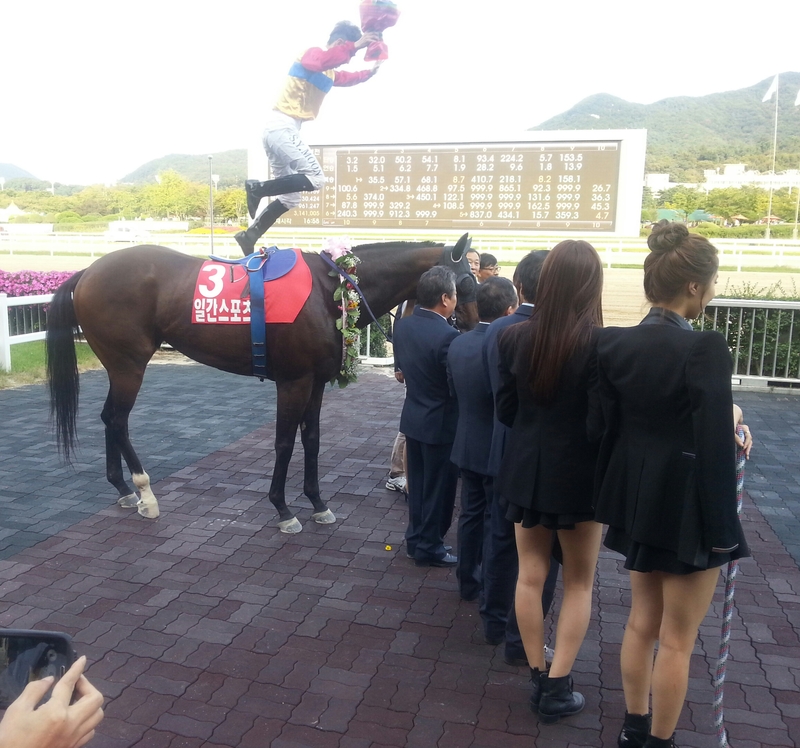 The pre-race favourite for the Donga Ilbo Cup was Fusion Korea. She finished 4th in what was a rare setback this weekend for jockey Ikuyasu Kurakane. The Japanese rider has been in remarkable form recently and scored 7 winners over the weekend; 3 on Saturday and 4 on Sunday. Sunday’s haul included the feature race when he smartly eschewed the ride on favourite Indian Blue – one of his regulars – and partnered another he has had success with in the past, Samjeong Jewang. 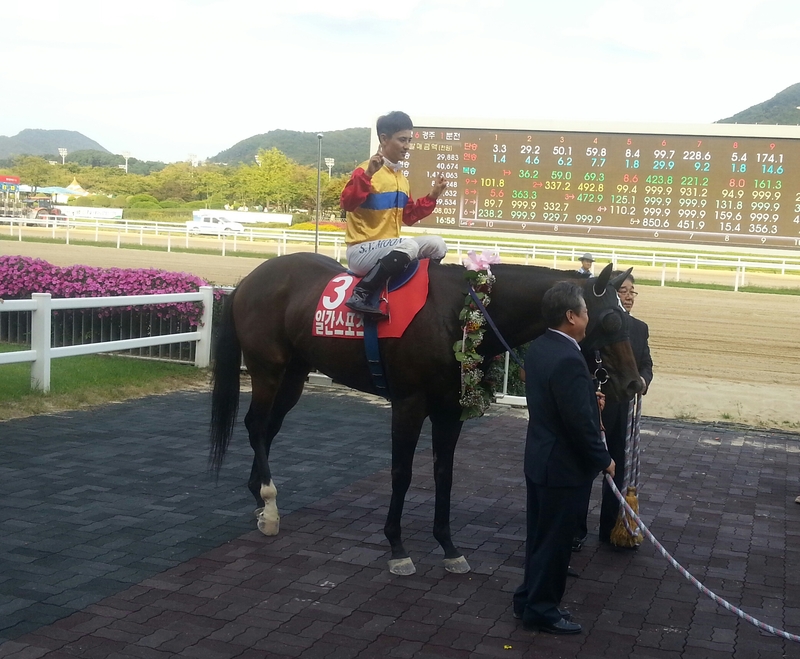 Kurakane is now clear 2nd in the Jockey Championship behind Moon Se Young with 77 wins so far in 2014. 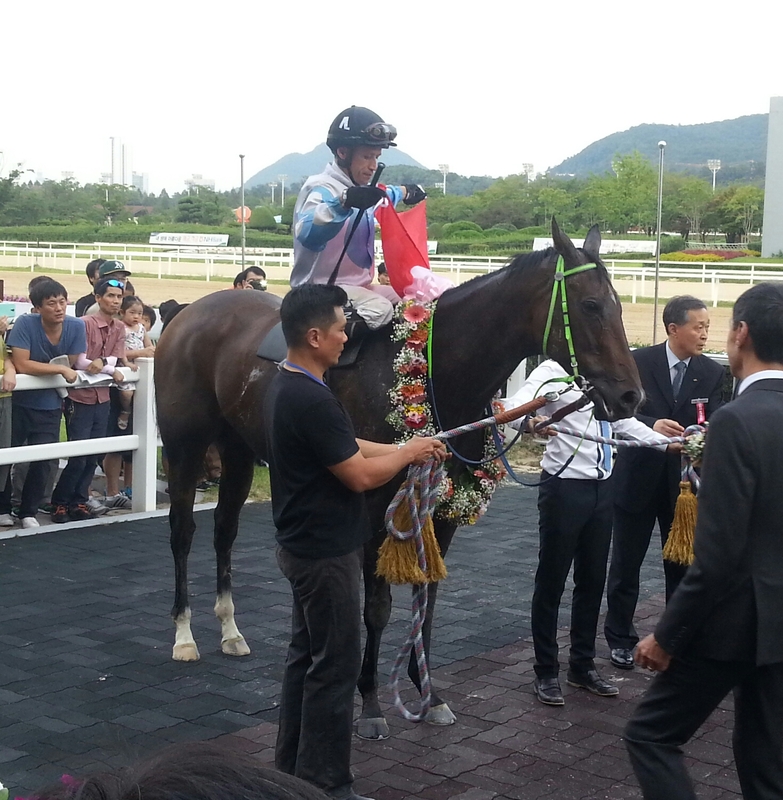 Down at Busan, there was another win for old favourite Ghost Whisper (Gotham City). Peter Wolsley’s 6-year-old grey recorded hs 13th victory from 25 starts when taking Sunday’s feature race by a length and a half from Wonil Gangja. Next weekend it is the big one. The final leg of the 2014 Korean Triple Crown – the Minister’s Cup – is set for Seoul Racecourse. If she runs, Queen’s Blade, winner of both the Derby and the Oaks, will be the hot favourite. Hangangui Gijeok took his record to 8 wins from 10 starts, powering away from Magic Dancer and Gyeongbudaero to claim victory in the Owners’ Cup at Busan on Sunday. Magic Dancer, winner of the Jeju Governor’s Cup in Seoul back in June, was sent off as favourite with Hangangui Gijeok second in the betting, just ahead of former Classic winner Gyeongbudaero, who was returning to the track after a 7-month layoff. It was Seoul filly Joy Lucky who set the early pace in the 1800 metre race, one of the richest of the year on the South coast. 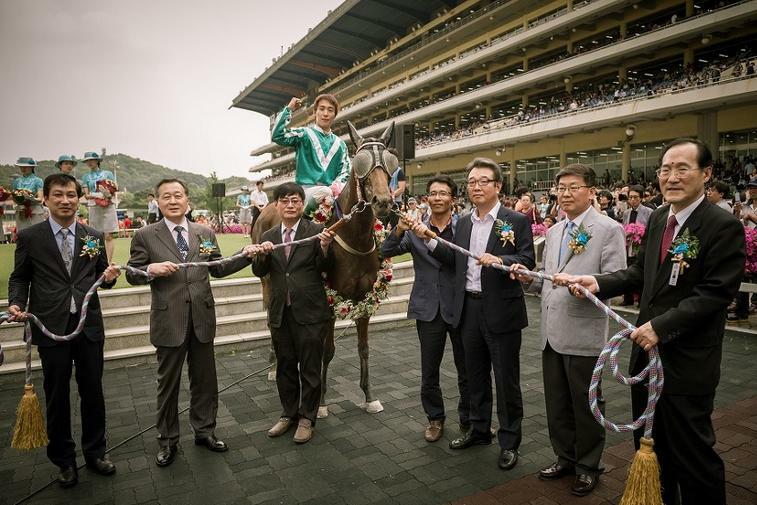 However, for the 2nd time in a row at Busan, the 4-year-old, who won the Seoul edition of the Owners’ Cup back in May, faded without trace as the runners entered the business end of the track. Instead it was the big three who came to the front. Gyeongbudaero and Hangangui Gijeok on the rail and stand sides respectively and Magic Dancer squeezed in between them as they fought down the home straight. It was the 3-year-old Hangangui Gijeok who found the most, eventually striding away for victory by a length and a half. Ineligible for the Triple Crown due to being a gelding, Hangangui Gijeok has been quietly going about becoming one of the most formidable competitors on the track. The narrow winner of the Gyeongnam-Do min Ilbo Cup in July, he came into this race off the back of six straight victories and now joins Magic Dancer and Derby and Oaks winner Queen’s Blade as Busan’s top rated horse. Yeongsan strolled to victory for the 6th time in 6 starts in Korea, securing his second Stakes win in the process, in the Ilgan Sports Trophy at Seoul Racecourse this afternoon. Unsurprisingly for a horse who had won his 5 previous starts by a combined margin of 53 lengths, Yeongsan was sent off the long odds-on favourite – indeed at 1.0, all that punters who backed him could hope for, was to get their money back. At least they were never in any danger of losing it. Moon Se Young brought Yeongsan to the front early and controlled the race, accelerating away from the field in the home stretch and then easing down for a 7-length win on the line. Yeongsan (Menifee) – who is officially known as “Yeongsan II” as there was an Australian filly of the same name in Korea 15 years ago – was exported to Malaysia as a 2-year-old but returned a year later. Yet to be seriously challenged by anything domestically, his next target is expected to be the President’s Cup, Korea’s richest race, in November and then a possible shot at the Grand Prix Stakes a month later. * Speaking of the Grand Prix, a former winner was in action at Busan today. 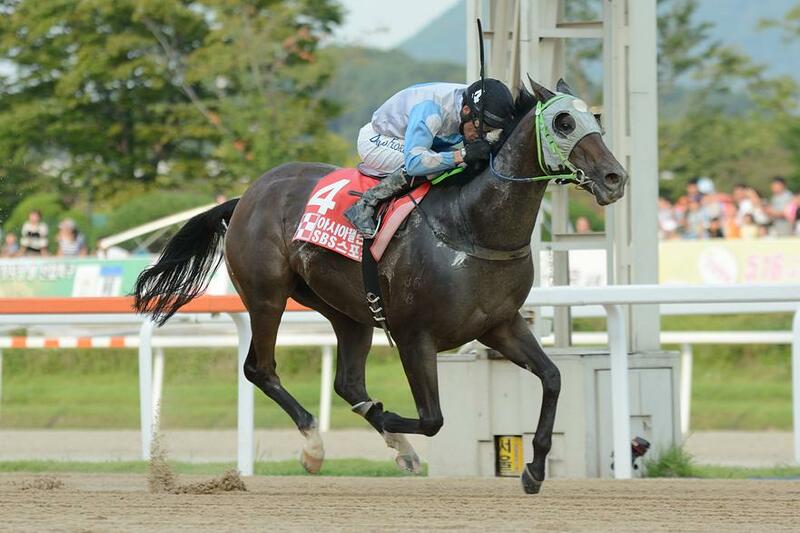 However, it didn’t go well for Gamdonguibada (Werblin) who, despite being sent off as a short-price favourite, was beaten a length and a half by old favourite Lion Santa (Lion Heart). Now 6-years-old, Lion Santa won his first 9 starts back in 2010 and 2011. While never really being able to go on and win the very biggest races, he’s been a solid money winner since and his victory today was his 13th from 30 lifetime starts. And it is at Busan where the focus will be next week when the southern track hosts the Busan Owners’ Cup. Magic Dancer, Gyeongbudaero, Joy Lucky – and back from his US jaunt – Major King, are among the entrants for this Busan vs Seoul race. 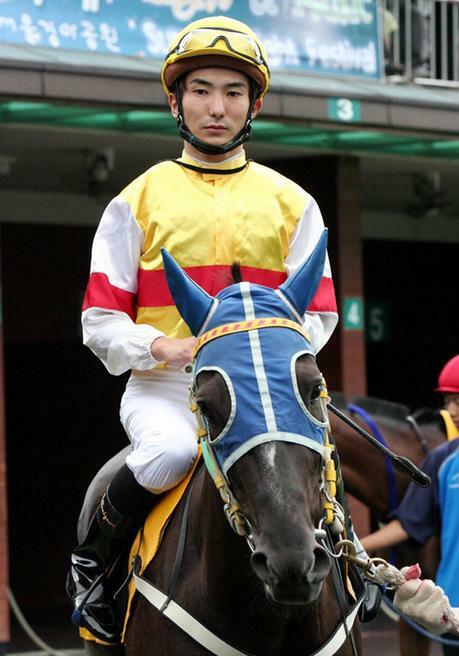 Shinichi Terachi has finished up his stint rising at Seoul Racecourse but there’s a familiar face back on the Korean racing scene as Nozomu Tomizawa returns to the peninsula to take up a 4-month jockey license at Busan. It was a challenging four months at Seoul for Terachi. The 35-year-old was able to get on plenty of horses but he wasn’t given a whole lot of quality to work with and ends with 7 winners from 159 rides. Whenever he got a horse with a chance of winning, he got the job done including two winners on his final weekend. He also won on one which didn’t look to have a chance. Terachi’s biggest victory came in June’s Sports Seoul Cup, the capital’s main Oaks trial race, on 27/1 outsider Geumbit Hwanhui. His departure leaves the remarkable Ikuyasu Kurakane, currently 2nd in the Seoul Jockey Championship, as the only foreign rider in the capital. That’s because it’s to Busan, where Masa Tanaka has been having to talk to himself in the weighing room since the departure of Darryll Holland and long-term injury to Joe Fujii, that Nozomu Tomizawa will go as he returns to Korea five years after he finished up his first stint here. Tomizawa arrived in August 2007 and battled away for almost two years racking up 47 winners from 722 rides at Seoul. He didn’t win any Stakes races but is best remembered for his partnership with the gelding Gamadongja – a horse that was really a sprinter – on whom Tomizawa won four Class 1 races at distances from 1200M to 2000M. It won’t be Tomizawa’s first time at Busan. He has one win from eight mounts at the South Coast track on weekends when he visited to ride in Stakes races. The 33-year-old has spent most of his riding career in Australia and should fit in well with the similarly Antipodean-accented Tanaka, who is also committed to the track until at least the end of this year. As for Masa Tanaka himself, the hugely personable jockey currently lies in 8th position in the Busan Championship and produced a cracking ride in Seoul this past Sunday to guide New York Blue to 3rd place in the Asia Challenge Cup. Two days before the Asia Challenge Cup, Tanaka rode a double at Busan, one of which was for trainer Bart Rice. The South African is maintaining his superb strike rate with 21% of his starters winning since he opened his barn at the track last December. Rice currently lies in 12th position in the Trainers’ Championship, having saddled more than 100 fewer starters than all but two of the trainers ahead of him. One of those two is Peter Wolsley, currently clear in 2nd place. No update on foreign riders in Korea would be complete though without talking about Joe Fujii, The man who took over Toshio Uchida’s title as “the most popular Japanese person in Korea” was in Seoul last weekend to watch the Asia Challenge Cup. While his broken shoulder is expected to keep him out for another three months, the ever-positive Fujii was in high spirits and with his license to ride in Korea having been extended despite his injury, he was looking forward to getting back to business on the track as soon as possible. Fujii has won the Derby, the Oaks and the Grand Prix Stakes. Korean punters are looking forward to his return just as much as the man himself. El Padrino showed his class with a dominant victory for Singapore in the inaugural Asia Challenge Cup at Seoul Racecourse on Sunday. Sent off as the pre-race favourite by Korean punters, El Padrino made a steady start, settling into the middle of the pack under jockey David Flores as local contenders Fly Top Queen, Watts Village and Cowboy Son made the early pace. Flores started to make up ground as they began the long-turn for home, improving around the outside – just like he had done on one earlier mount in a previous race. 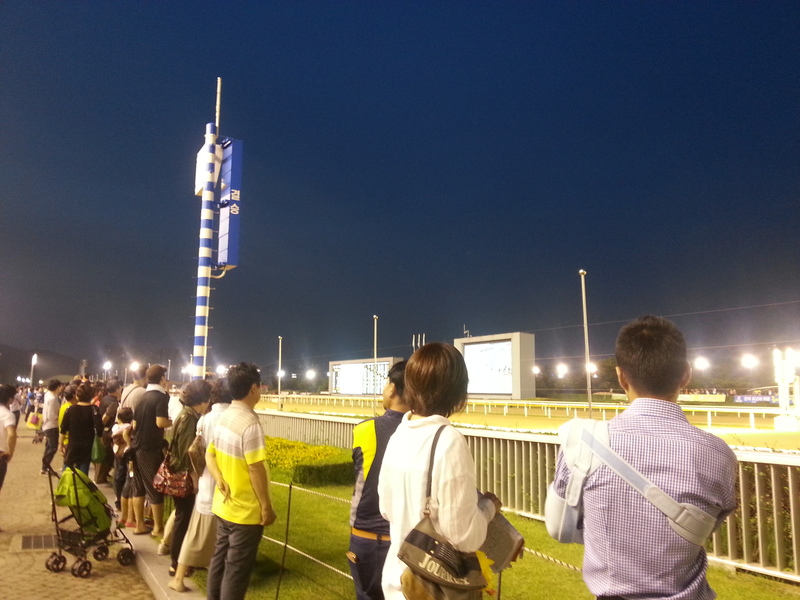 Tracking him was Lee Chan Ho on Wonder Bolt, the 3rd favourite. Ultimately, El Padrino would win by two lengths in a track record time of 1:23.8. Wonder Bolt also finished inside the old record, a full eight lengths ahead of 3rd placed New York Blue. The Japanese pair of Toshi Gang Star and Pierre Tiger came home in 4th and 5th. There was disappointment for the other two Singaporean raiders; Speedy Cat and Trudeau never getting into a rhythm and coming home 9th and 10th respectively. Meanwhile, those early pace-setters and frequent rivals, Fly Top Queen and Watts Village were the last two home. 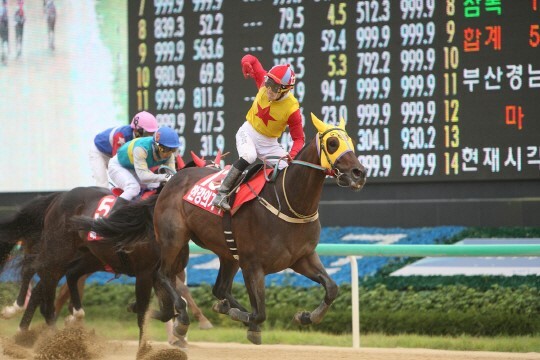 The race capped an important weekend for Korean horse racing. Unprecedented work had gone into securing a quarantine protocol which would allow the Singaporean runners to visit – a similar one was completed with Japan last year and involved the creating of an expanded quarantine zone at the racecourse. At a welcome dinner the previous evening, the Chairman of Toko City Keiba, representing Japan – where there will be a return leg for three Korean horses in November, a race won by Watts Village last year – spoke as did the Chairman of the Singapore Turf Club. The race was broadcast live to Singapore where it made up part of the Sunday card at Kranji. Regular simulcast broadcasts to Singapore – 14 races were broadcast on Saturday – also began earlier this summer and is generating a steady turnover. At the track, the usually stuffy 6th floor was livened up by the presence of some boisterous visiting connections, especially those representing Trudeau. Even the parade ring actually looked like a big race was about to take place. A year ago, simulcasting and an international race of this standard – even after the successful running Japan/Korea Goodwill Cup, looked an incredibly long way off. But it has happened. Even some imitators of this blog have started up. After years of nothing, progress has suddenly gathered pace. On Sunday, the pace everyone was talking about, belonged to El Padrino.